Happy Monday everyone! As the first daffodils start to rear their heads we can’t help but turn our minds to spring. And what does spring mean? The start of wedding season. It has now become popular amongst wedding photographers to work with a second photographer, also known as a ‘second shooter’, at almost every wedding they photograph. 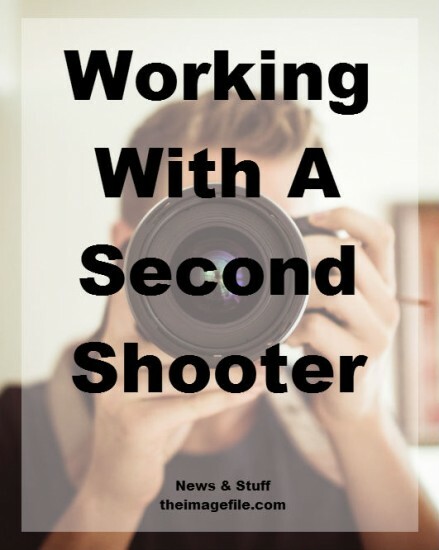 So is working with a second shooter for you? And how should you handle working together? WHY WORK WITH A SECOND SHOOTER? As a wedding photographer you have a lot to deal with on the big day from making sure the timeline runs smoothly to capturing all the important events of the day. Many wedding photographers like having a ‘coworker’ along for the day to help them when they need, to capture an alternative second angle of the major events and help everyone stick to the timeline. WHAT TO LOOK FOR IN A SECOND SHOOTER? Personality – Of course you need to like and get on with your second shooter. You need to make sure that your personalities fit, that you can communicate openly and effectively as well as support each other on the day. Equipment – In theory it shouldn’t matter if the second shooter doesn’t have exactly the same equipment as you, as long as you are confident that the images captured are to the same exacting standards you keep. The manufacturer of lenses, back-up processes, flashes systems etc. not matching might have little consequence, however the cameras being in different aspect ratios could later create a real headache! If you are particularly fussy about the type of equipment used then stipulate that early on. Experience -You must realise that if someone has contacted you about working as a potential second shooter it is most likely to gain experience before branching out on their own. The most important thing to consider is the creative eye and portfolio, however you need to think if there are any real ‘deal breakers’ that need to be addressed. For example are you uncomfortable working with someone who has absolutely no experience in your genre but does have experience in other areas of photography? WHAT ARE THE MAIN PRE-WEDDING GUIDELINES? Be Kind – Your job as a wedding photographer is to make everyone you come into contact with feel happy, at ease and comfortable. This is also true of a second photographer. Be On Time – It’s imperative that a wedding runs on time and smoothly. This should be conveyed to any second shooter. If they’re late or running behind, that affects you, which then affects the rest of the day. Settings – Date and tIme sync your cameras. That way all photos can be uploaded and the chronological order will make things simple for both you and your client. Agree on a filename policy. Having filenames all displayed in different ways is confusing and looks messy. Select the same aspect ratio and file type for easy post processing. Dress Professionally – Of course you need to be comfortable and able to work in the clothes you have on. However it’s important to establish early on the standard of dressing you expect from your second shooter. Some photographers insist that you ‘match’ e.g. you both wear black whereas others don’t care what you wear as long as you look professional and respectful e.g. no jeans and tshirts. Their Priorities – When you book a second shooter you need to make it clear what their priorities are on the big day. For some wedding photographers all they want from their second shooter is to photograph a different angle of the day, whereas others require more of an assistant role e.g. moving the dress, clearing the space, holding the veil etc. Marketing – Most wedding photographers require that the second shooter does absolutely no marketing. This may sound strict and an uncomfortable thing to explain but think of it this way; the wedding was booked through you – the main wedding photographer – and the second shooter is therefore a contractor for your business. The two of you are therefore a united front for your business on that wedding day so there should only be marketing for your company. Be Clear About What Your Expect – If you have a specific idea of what you want your second shooter to capture on the wedding day, then you must communicate it. Don’t assume that your second photographer will just know. Some wedding photographers like their second shooter to capture the groom getting ready, as well as other angles of the major events throughout the day. WHAT ARE THE MAIN POST-WEDDING GUIDELINES TO CONSIDER? Image Delivery – Decide when you want your second shooter to deliver their images. Do you require they upload them before they leave the reception or give you a back up drive for safe keeping? Or do you not care as long as they arrive at your studio within a certain time frame? Image Usage Rights – Are you going to restrict what the second shooter can use their images for e.g. they can write a blog post using their images but only after you have written your own blog post? Facebook – It’s common to share images of your latest events on Facebook. However consider if you are going to allow your second shooter to share their images on Facebook or if you are going to restrict them? For example can they share a link to their blog post of that wedding but not share an album of the images? Their Website – Do you have stipulations about how second shooters display their images on their website? For example if you shot Sarah and John’s wedding together, can they create a gallery on their website called ‘Sarah and John’ or can they only display some of Sarah and John’s images in their ‘weddings’ portfolio gallery? These may sound like obvious details but it is important to set out your expectations from the very start. Have you ever booked a second shooter? If not would you now consider working with one?